8 beautiful puppies on Friday, August 5th. 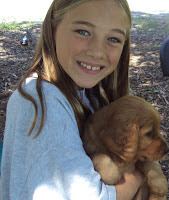 PRICE REDUCED TO $500.00 FOR MADDIE'S REMAINING PUPPIES. CALL 585-392-2763 FOR MORE INFO AND TO SET UP A TIME TO VISIT. Apple Country Veterinary on North Avenue in Hilton! Everybody looked good. No problems. "Little Red" who is now "Bailey" was picked up by her owners and fond 'aunts' yesterday! And "Lucas" will be joining his family in the Bronx next week. And "Chloe" is now home with her family in Hilton! Six pups are still available. Four males, two females. AKC registered. Feel free to call us to set up a time to meet the puppies and us. We love visitors here at Hearthside. Sweet dogs. Great dispositions. Family oriented.